In the beginning, there was the cutter. This was a tiny bar of sapphire sharpened to a V with an angle varying between 60º and 90º, Europe tending towards the former and America the latter. The depth of cut, maintained by counter-weights and sometimes supplemented by a ball travelling on the wax just in front of the cutter, was supposed to be about .0025" (2.5 thou.) but often varied due to local conditions on the day and engineer’s judgement. In our early jazz field, we have to concern ourselves also with the smaller, or specialised, or less technologically-aware companies where blunt or misshapen cutters and odd groove-depths occur. Every day may have produced a different setting! However hard a ‘shellac’ 78rpm record may look or sound by tapping, it is still a crumbly plastic full of clay, carbon black, aluminium flake, gypsum, powdered limestone, fibres, Fuller’s Earth and slate dust – yes, Bryson says, “records have been manufactured containing as much as 70 per cent of this material" – all bonded with shellac and other resins. When one scrutinises a field of grooves through the microscope, one can observe just how easy it is topush through a groove wall with a specially- mounted stylus –like pushing a finger through some classic English Cheddar cheese. The following reference table give you an even better indication of where to start fitting the groove – as you have by now gathered there are no hard and fast rules but, based on years of playing a variety of makes and ages of 78s and covering a timeline of 1895-1950s, this table will give the reader a fairly good idea of where one should base their starting point. Anomalies abound, as one might expect, and some notable ones are mentioned where appropriate. We’d love to hear from you if you know of similar exceptions to the rule! Whilst we do not claim that this table is exhaustive or 100% reliable in each and every case (see comments above about riding above or below groove wear/damage) it does give a good starting point for individual experimentation. Ultimately, your ears will be the best judge and it is always worth noting a disc’s preferred stylus size on the sleeve for future reference. 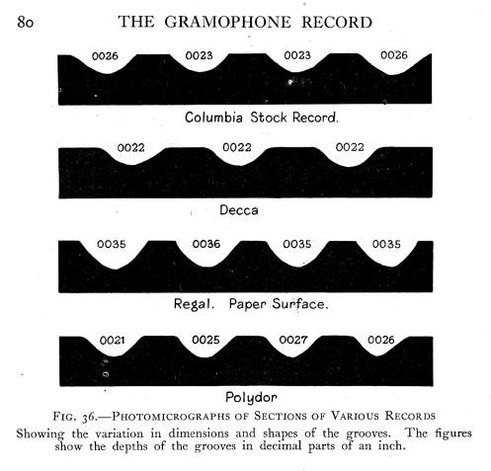 As can be clearly seen, the vast majority of records fall into just three stylus sizes – 0.0024/5", 0.0028" and 0.0035". If one’s budget only runs to three styli, these are the ones to go for. Read, Oliver and Welch, Walter L., FROM TINFOIL TO STEREO, Howard W. Sams & Co. Inc., and The Bobbs - Merrill Company, Inc., Indianapolis & New York, 1959. Thanks also to Russ Shor and Malcolm Shaw for their assistance. 00.18” Useful for some acoustic Richmond Gennett recordings: Some early aluminium and acetate transcription discs. 0.0020” Extremely useful for the majority of acoustic Richmond Gennetts. Strangely, the Wolverine Orchestra’s Fidgety Feet/Jazz Me Blues like a whopping 0.0035"! Also a number of acoustic OKeh ‘field’ recordings (e.g. the 1923 King Oliver OKehs) like this size. 0.0024/5” Very useful for acoustic, ‘Truetone’ and some electric OKehs, pre-1920 Victors, most post-war records. Many Paramount 12700 series. English Columbias 1925-26 mainly prefer this size. 0.0028” Post 1922 acoustic and electric Columbias, most electric OKehs, acoustic and early electric Paramounts, Gennett (acoustic and electric New York recordings and electric Richmond recordings), Brunswick/ARC (acoustic and electrical), US Decca, Victor 1921-25, most Plaza group acoustics, pre-1931 Parlophone, Black Swan, Cameo, Pathé/Perfect lateral recordings. A good starting size to work up or down from. 0.0032” Useful for some Brunswick/Vocalion electrics, post-EMI merger English Columbia/HMV/Parlophones, Columbia acoustics to 1922, some early US Columbia electrics, also some later Columbia electrics where the master has been heavily polished or high numbered stampers have been used. Autograph, some Paramount 12800s (though these vary enormously – up to 0.004"! 0.0035” Most Victor Electrics post 1926, some very early Victors (1901-06), Acoustic Vocalion, HMV/Zonophone 1925-31, most QRS, Plaza group electrics, Edison Diamond Discs, most Electrobeam Gennett post-6400 issues. 0.004” Early electric Victors (1925/6). 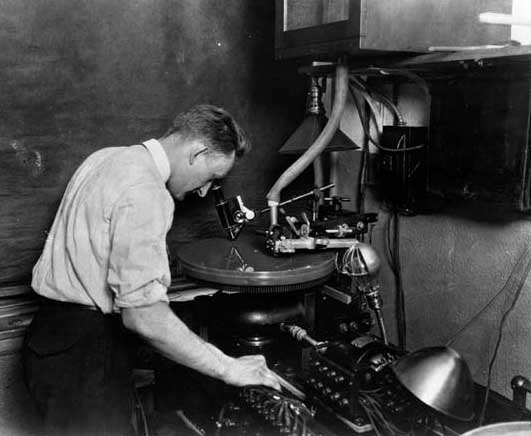 One notable anomaly is the October 1927 Brunswick session by Johnny Dodds’ Black Bottom Stompers, where the cutter was particularly blunt and all the sides from the session need a 0.004" stylus. Expert Stylus Company, PO Box 3, Ashtead, Surrey KT21 2QD, UK. Tel: +44 1372 276604; Fax: +44 1372 276147. Email info@expertstylus.co.uk Expensive (and a near – monopoly), but they are the best in the business and the first choice for professionals and collectors the world over. Their years of experience and friendly - and free - advice will benefit both neophytes and old hands alike. KAB Electro - Acoustics, P.O. Box 2922, Plainfield, NJ 07062 Tel: (908) 754-1479 /Email: info@kabusa.com Web site: http://www.kabusa.com A very helpful and knowledgeable specialist company, usually with a limited availability for given stylus sizes.